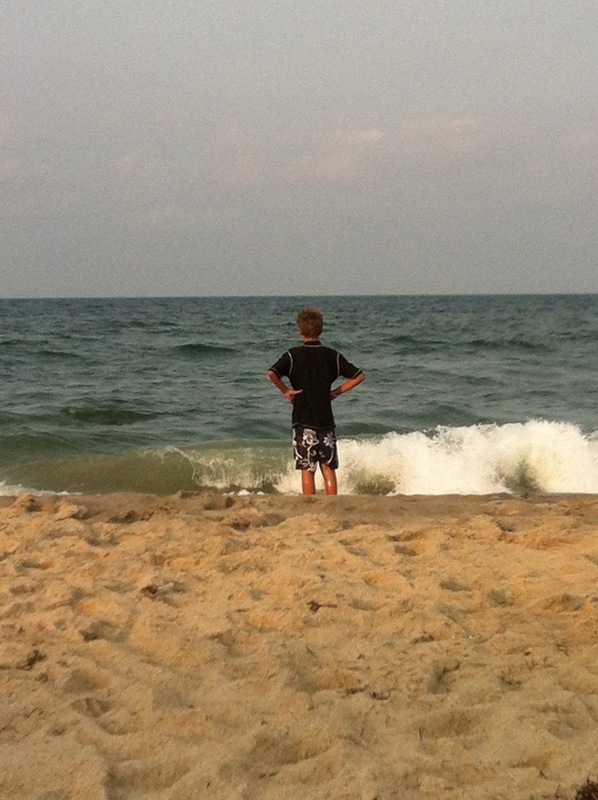 Ryan contemplates the sea. He does this a lot. This morning, I shaved and put on shoes of the non-flip flop variety for the first time in 10 days. I was not happy about either of these developments. This morning, it’s back to the routine, back to the morning commute, back to reality. I was happy, thrilled even, to return from a lot of previous vacations. Finding something that works for our entire family has always been a struggle. Ryan often wanted to go home after just a few days, and we were right there with him, done in by a lack of sleep and the constant struggle to recreate enough of his home routine to keep him comfortable while still keeping him engaged in the trip. Last summer, we went for it. We rented a beautiful oceanfront condo for a week in the Outer Banks of North Carolina. Among the key selling points, each child would have their own room, giving us the best chance to have a decent week of sleep. Also, there were both indoor and outdoor pools in case either child tired of the ocean or if we got bad weather. Neither happened. We had a week of glorious weather and plenty of low-key beach and pool time. Riley made friends will all the girls of similar age staying in the complex and spent the week boogie boarding and digging for sand crabs. Ryan tentatively tried out the ocean, spent hours in the pool, and still got his computer and Hockey Guys time in the mornings, evenings, and at lunch. The week was amazing. I’m not ashamed to say I cried on the day we had to leave as we took one final walk on the beach and watched the ocean wash away our footprints. By some measures, we hadn’t done much, other than sit by the water and watch our kids play. We went out for one meal. I took Riley to the Wright Brothers memorial. By other measures, the ones that mattered to Veronica and me, we had accomplished a lot. We ate dinner together every night. Ryan never asked to go home. True, we had to coax him back outside at times, but he willingly went in the ocean and pool, and found other ways to amuse himself. Mostly, we were just together, and it was normal. And that is something that we will always celebrate. When it came time to think about a vacation for this summer, we didn’t hesitate. We booked the same unit in the same complex. As anyone who has rented for a summer week in the Outer Banks knows, getting there on Saturday — changeover day for most rental units — is quite a task. Last year, at the end of a 10-hour drive, we sat in stop-and-go traffic for the last 10 miles to get over the one bridge that everyone has to take. Ryan was struggling to hang on, and we were all quite irritated. We counted down the tenths of a mile by naming NHL players with those numbers. Not 8.7 miles to go, Sidney Crosby miles to go. When that failed to distract them any longer, we turned to music. Veronica put on the song “Good Life” by OneRepublic, one of Ryan’s favorites. In truth she also loves it because of the Disney commercial with the happy family on vacation. That, and a few other songs, got us over the bridge. Traffic broke up, we stopped at a restaurant for a late lunch, and never looked back. The only thing we worried about in booking the same trip for this year was that perhaps the bar had been set too high. Last year’s trip was as close to perfect as possible for our family. Could we recreate it? In the back of both of our minds, Veronica and I worried that chasing perfection might lead to disaster, especially as the trip got closer and the advanced weather forecast looked so-so at best. No, the weather wasn’t great, with lots of clouds and passing showers, but we were in the water every day (although we did finally take advantage of the indoor pool on a couple of occasions). True, Ryan had his difficult moments including one severe meltdown that brought reminders of this and nearly broke my heart. But the trip was still a huge success, and we are planning to return next year. We even left a note hidden in the condo for us to find in a year’s time. Ryan set the tone for the trip on the morning after we arrived. Traffic hadn’t been quite as bad the day before, but we still took a while to get over the bridge, so we again turned to music. Veronica put on “Good Life,” when nerves were getting frayed. The next morning at breakfast, Ryan came to me and said something profound right out of the blue (as he often does). “Dad, you know what song we should have played when we got stuck in traffic?” he asked. “That song ‘I’m going home, to the place where I belong,’ ” he sang in response. He could not have put it more perfectly. Hi there, found you from another blog. Great post, and sounds like a wonderful vacation. So glad to hear that you got lucky two years in a row. Hope that trend continues. I love it when vacation turns out well…even with a few “bumps” in the road. It really sounds like you’ve found a home-away-from home in NC. Good luck with the re-entry into reality…it can be brutal. Re-entry is proving extremely difficult. But we’ll get through it. Thanks for the good thoughts.